As the winter weather season creeps up on us, it is important to remember how the snow and sleet effect shipping times. Even though you live in sunny California (lucky), weather delays due to snow in the Midwest may still delay your shipments. This is why Installerstore recommends that you track your package online via the shipping carrier during the entire transit. This way you will know of any shipping delays caused by the weather or holiday season. Our company ships via the US Postal System, Spee-Dee Delivery Service and UPS. Once your package ships, you should receive a tracking number via email. If you do not receive this tracking information by the expected ship date, please contact us and we can manually give you this tracking number. 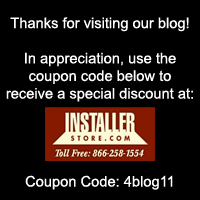 You can reach us by phone at 866.258.1554 Monday-Friday 8:00 AM-4:30 PM CST or by email at sales@installerstore.com. During National Holidays such as Thanksgiving Day (Thursday Nov 26), Christmas Day (Friday December 25) and New Years Day (January 1), UPS will not be delivering packages, which means shipments during this time will not have any forward progress. Shipment guarantee times are suspended for UPS Ground for packages shipped between December 11 and December 24. This means if UPS normally lists your zip code as a 2 business day transit and you order between December 11 and December 24, there is no guarantee by UPS that the package will be delivered in that estimated time. Although UPS lists that UPS Air packages (UPS Next Day Air, 2nd Day Air, etc) have guaranteed shipping times, Installerstore.com has no control over this guarantee. Here is a link directly to UPS Peak Season Holiday Shipping Season. Severe weather throughout the US can cause significant disruptions. Although contingency plans are in place with major shipping companies to minimize service disruptions, there are unavoidable service delays. For an up to date list of Severe Weather Delays by UPS, check out their website UPS.com.